Thank you for all the kind comments on my recent accomplishments. I’ve even surprised myself this year! Several people asked how I was able to get so many things finished. I think part of my “secret” is that I typically wake up several hours before Tom does, and I use that time for stitching. If I’m lucky, I can also get in some more stitching at night. I usually can’t stitch much during the day. I prefer to stitch in hand versus using a frame. I like the “feel” of the linen. Several asked if I’m a “sewer” or a “stabber”. Depending upon both the project and the particular stitch, I use either the sewing or stabbing method. For example, on my current project, the Amy Eliza Herbert sampler, I’m using the stabbing method because I’m working with two plies of thread and railroading the stitches. If I’m using only one ply of thread, I can work cross stitches and some other stitches with the sewing method. Closed herringbone, four-sided, and nun’s stitches are several that I always work with a sewing method. If you want to see a fast stitcher, look at people who do the two handed method. Wow--do they zip along. They work with one hand, usually the dominant one, on the underside of a frame and the other hand on top. Unfortunately, I’m not coordinated enough to do this. I think the other way I stay focused is to make a list of what I hope to accomplish each year. This year I surprised myself by surpassing my initial list. (Last year, I fell way short.) I’m now trying to make my 2010 goal list. I just need to remind myself not to get too enthusiastic, but instead to be realistic. I have also decided that I’m not a good rotation stitcher. I need to stick with one project, although occasionally I may have two “active” ones in my needlework basket. Below is my current progress on Amy Eliza Herbert. I can’t remember when I started her, but I know it was before I started designing in 1999. Sadly, this lovely sampler was put away for heaven knows why. I’m so happy that I stumbled upon her again. This sampler was charted by The Porcupine Collection in 1987. According to information in the chart leaflet, the large house with its three sections is typical of houses found on samplers from New Jersey. Amy’s original sampler is part of the DAR collection in Washington, D. C.
One of my goals each year is to finish at least one WIP (work-in-progress). This year that piece was Dutch Beauty. In 2010, it will be Amy. My teaching schedule (posted both at my website and in the sidebar of this blog) has just been updated. I have a couple of openings for next year. Oh my goodness! Now I want to stitch Amy Eliza Herbert too! She's beautiful!!! I'm glad you rediscovered her to inspire me. :D I'm an in hand stitcher as well. I do envy those people who stitch with two hands not holding their frame. I think they're so fast! Have a wonderful Christmas, Ellen! Wow Ellen, that looks fantastic. I've had this chart in my stash for years and years and never knew that it could look so good. I just may have to pull it out and fit it in for 2010. I'm one of those people that use a scroll frame and am a two handed stitcher. I can stitch fast, although time is always a factor - not much of it! Can't wait to see more of your progress on Amy. She looks wonderful! 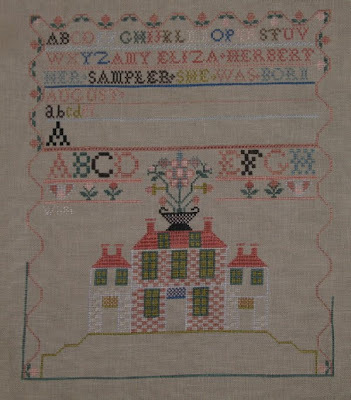 Amy Eliza Herbert is such a pretty sampler both in design and colors. Thanks for the suggestion of making stitching goals for the year! AEH is gorgeous!!! I have the chart, your colors are gorgeous. Did you change them? Huge congrats on finishing Mary Busby too, she's so pretty. This really is such a pretty sampler! I saw it stitched years ago at a needlework gathering at Connor Prairie (in Indiana) and fell in love with it. The photo on the chart cover doesn't do the sampler justice--but at least the photo is better than my photo. I got the doors in the morning, athough I didn't enjoy working them in the split stitches. If you stitch the sampler, you'll note that the side areas of the doors are charted in a different color than what is shown in the photo. The photo, and not the chart, is correct. John and I wish you and Tom a very Merry Christmas. Thank you for all you are and how you make the world a brighter place.